Thinking about theology, philosophy, and other stuff. Let’s continue thinking about holiness. There seems to be a conflict. Christianity Today asks the question, “Do American Christians Need the Message of Grace or a Call to Holiness?” What is your answer? My answer has not always been warmly received. I’m still trying to figure out why. Personally, grace is like ice-cream. You can’t have too much. Maybe Paul clears up the confusion when he tells us to “put on the new self, created to be like God in true righteousness and holiness.” (Ephesians 4:24) “True holiness?” Did you catch that? If there is true holiness, there must be false holiness. Maybe we’re all hung up on a holiness that is false. False holiness is about keeping Christian rules. False holiness is about keeping away from bad influences. See any problem with the above definitions of holiness? One big one! Jesus. Jesus was holy. No question about that. Yet, Jesus broke quite a few religious rules – so many and so often that the religious leaders put him to death. Maybe Christianity is not about keeping the rules. Keeping away from bad influences? Jesus kind of messes with that one as well. “A friend of sinners” (Matthew 11:19), Jesus was called. He hung out with and even ate with people who were “bad influences.” The Gospel writers didn’t say that Jesus tolerated sinners, or that he made an allowance for them to be in his gathering. It doesn’t say that he tract-bombed them and then ran. No, the writers tell us that he was a friend of sinners. He went to their houses, talked with them over wine (not grape juice). For those who follow a false holiness, holiness requires them to keep away from certain people. For Jesus, holiness compelled him to reach out to those same people. So, no one lived a holier life than Jesus, yet he broke religious rules and the irreligious considered him to be their friend. There’s a better way. True holiness. Think about this until next time: What was the first sin about? A broken rule or a broken relationship? Did God really care about a piece of fruit? When Adam and Eve broke the rule they were demonstrating that they didn’t trust God. They doubted God’s love and goodness. “Faith (dependence on Jesus), expressing itself in love.” Now, that’s true holiness. “Do American Christians Need the Message of Grace or a Call to Holiness?” That is a question recently posed for discussion by Christianity Today. The question hits home. One comment directed my way over the last few years was, “Phillip, you need to preach more on holiness and less on grace.” That statement probably reflects more on my poor preaching than anything else. I was glad to see through this article that the tension between grace and holiness is not isolated to my little world. The desire is right – we want to live “holy lives.” But what does that mean? And how do we do it? Today, let’s talk what it means. I’m telling my age, but I can’t hear the word “holy” without thinking of the old Batman TV show from the 60s. Before the dark, deep, Batman movies of today, there was the campy, cheesy TV Batman with his side-kick Robin. Each week the duo would fight the colorful criminals of Gotham City and each week Robin would come out with a new take on “holy” – “Holy Caffeine,” “Holy slipped disc,” “Holy popcorn,” “Holy hole in a donut.” Yes, this was entertainment. Pretty outrageous statement by Paul, isn’t it? I am a temple. God lives in me. And this temple is holy. I don’t have to try to be holy. I already am. God said so. The point: Our behavior does not determine who we are. Their holiness didn’t have anything to do with what they did or didn’t do. It was God’s doing and their position in Christ that made them holy (See 1Corinthians 1:30 again). Do you see where grace comes in? Do you see how grace is connected to holiness? Grace and holiness – like peanut butter and jelly. Grace is the simple reality that Jesus did everything. We are saved through grace. We are holy through grace. To preach holiness without grace is behavior modification. Christian growth does not happen by behaving better but by believing in bigger, deeper, brighter ways what Christ has already done for us. What is holiness? It is Jesus. He is the definition of holiness and by the working of God’s grace, he has become our holiness too. Pastor and friends enjoy a good meal at Applebee’s accompanied by excellent service. Pastor receives a check with an automatic 18% “six or more” gratuity added to the total. Later that day, a waitress who had not served the pastor took a picture of the receipt and posted it online with a note reading, “My mistake…I’m sure Jesus will pay for my rent and groceries.” The internet went crazy. 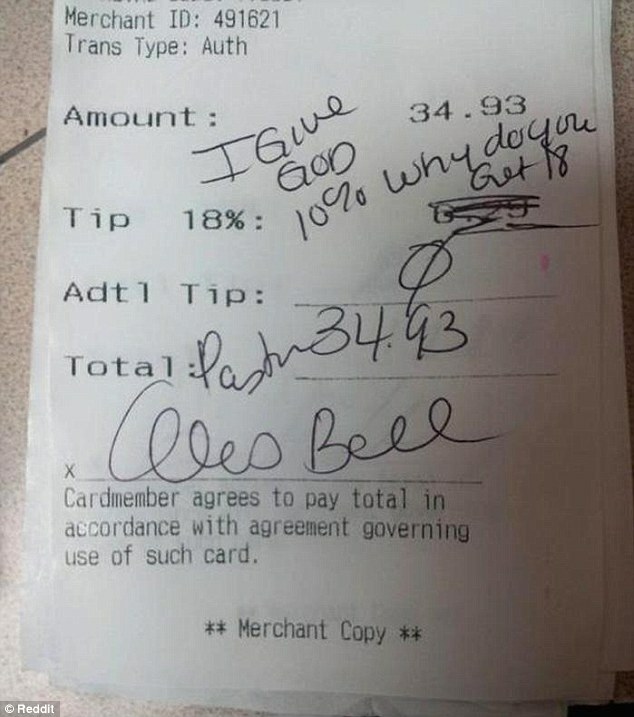 After seeing her receipt, complete with her signature on the internet, the pastor complais to Applebee’s which promptly fires the poster. The pastor apologizes saying that her actions show a “lapse in my character and judgment.” She continues, “My heart is really broken. I’ve brought embarrassment to my church and ministry.” You think? Another case of a Christian gone bad? I’m not going to come down hard on the pastor. While I do give a generous tip to servers I’m not always so generous in the kindness department to telemarketers, tech support people, and a few others. Nope. I’m not in a position to throw rocks. The pastor is right. She did bring embarrassment to her church, ministry, and, I think, to Jesus. How about us? Anything we’re doing to embarrass Jesus? According to studies, God has a flock full of cheapskates. A 2012 study by Cornell University tipping expert Michael Lynn showed that Jews and people with no religion tip better than self-identified Christians. The personal stories of servers being stiffed by Christians are sad. To top it off, instead of leaving money, some leave a cheesy gospel tract – a practice called tipping with a tract. One server got excited when he saw what he thought was a $10 bill under a plate Instead, it was a fake bill with these words, “Some things are better than money.” Turn it over and it reads, “like your eternal salvation, that was bought and paid for by Jesus going to the cross.” The server posted photos of the note with these words, “I have never been more atheist.” I don’t think the tract worked. I wonder how many people have given their lives to Christ because a customer tipped them with a tract instead of money? “Everybody at Chili’s hates waiting on Christians,” says one server. Some restaurant experts say that Sunday is famous for having the highest food sales but the lowest tips. How can I preach about an extravagant, grace-giving God and be stingy? God was a major player in last night’s Super Bowl game between the Baltimore Ravens and the San Franciso 49ers. According to one of the commercials, God made a farmer to sell Ram trucks. 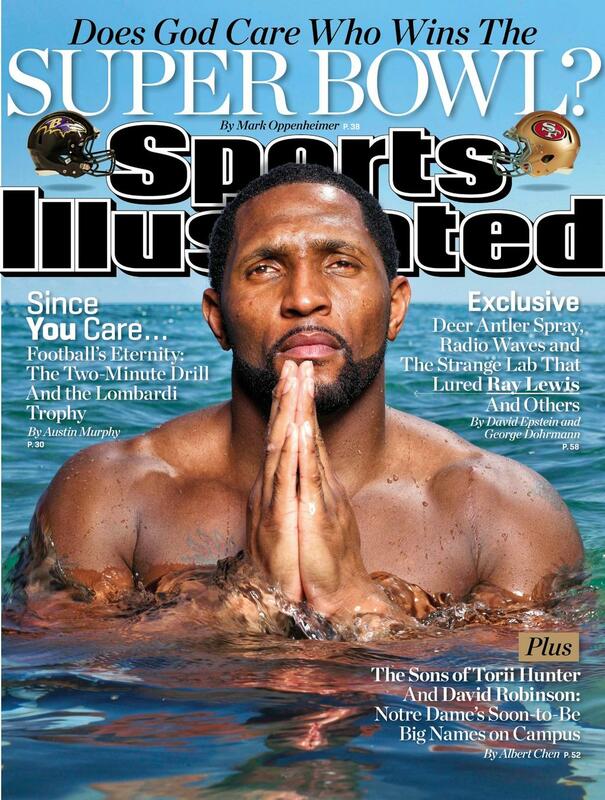 And according to Ray Lewis, God was cheering for the Ravens. I’m not a big fan of the 49ers (I’m still upset over “The Catch” of 1982 when Montana connected with Dwight Clark in the final minutes, beating the Cowboys), the Ravens (I don’t know why…I’m just not), nor Ray Lewis. I am, though, a big fan of Paul Harvey and God. The commercial was an appropriate hug of America’s farmers, delivered by Paul Harvey, taken from a 1978 speech at the Future Farmer’s of America convention. Nothing against Chrysler, I’ve driven one, but I don’t think God gave us farmers so we’d buy a truck. And then there’s Ray Lewis, the very talented and out-spoken linebacker for the Ravens. He often wears his Christianity on his jersey so it was no surprise that in his post-game interview with Jim Nantz, Lewis gave a shout out to God, “It’s simple: when God is for you, who can be against you?” Really Ray? So God is for you and the Ravens but against the 49ers? God is for brother John and not brother Jim? God is for the Raven fans and against the 49er fans? Did God blind the eyes of the officials on that 4th down play at the end of the game so that they missed the obvious interference? If God influences which teams win championships and He rewards athletes who have faith with success, then God’s favorite team must be the New York Yankees (27 world championships) and He must really not like the Cubs. And what about Tim Tebow? Where did his faith get him? Banished from the Broncos and now the Jets. How does God work? Does “winning” mean God is pleased with us while “losing” means that God is displeased with us? We may not admit it but we believe it. We secretly judge people who are struggling financially or experiencing some kind of trouble because we think they must not be right with God. When it happens to us we think, “If I were a better Christian, this wouldn’t be happening.” “Bad things happen. I must have been bad.” “Good things happen. I must have been good.” Ray Lewis must have been good. Colin Kaepernick of the 49ers must have been bad. When someone who is bad gets something good we are confused and angry because he or she didn’t earn it. That’s bad theology. Here’s good theology. When we were bad, God did something good for us. God is the major player in our lives. God is for everyone, not desiring that any should perish 2 Peter 3:9. Get updates on the new church! Sign up for our newsletter!